Botnets continue to spread to places never dreamed of a few years ago. But you can fight them off, and these tips can help. Botnets have been around for over two decades, and with the rise of the Internet of Things (IoT), they have spread further to devices no one imagined they would: routers, mobile devices, and even toasters. 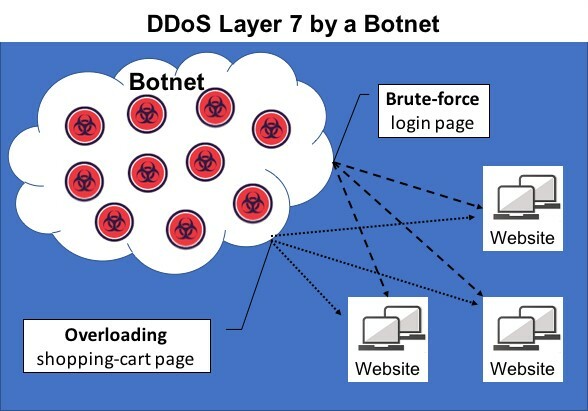 Some botnets are legions of bot-soldiers waiting for a command to attack a target server, generally to overwhelm the server with a distributed denial-of-service (DDoS) attack. Other botnets target specific devices by stealing passwords or mining cryptocurrency. Cryptocurrency mining, in particular, has been a dramatically growing threat for organizations recently, with botnets such as Coinhive and CryptoLoot enabling cybercriminals to make as much as $100 million a year at the expense of victims’ computing power. Smominru, among the largest cryptocurrency-mining botnets, has infected over half a million machines using the infamous EternalBlue exploit leaked from the NSA. To prevent botnet infections, organizations must be able to detect them. But botnet detection isn’t easy. Let’s explore some of the top techniques and challenges in botnet detection. So, what’s a botnet? Simply put, it’s a cluster of bots — compromised computers and devices — that perform commands given by the botnet owner. Usually, the botnet owner will dedicate a command and control server (C2), a compromised server for communicating with the bots, usually via Internet Relay Chat commands. The botnet owner uses the C2 server to order botnets to execute attacks, whether that’s DDoS attacks, data theft, identity theft, or another type of attack. Thus, the smoking gun that points to a botnet is its C2 server. Unfortunately, finding the C2 isn’t usually a simple task. Many botnet commands emerge from multiple servers or take hidden forms, masking the malicious commands as harmless activity such as Tor network traffic, social media traffic, traffic between peer-to-peer services, or domain-generation algorithms. Further complicating matters, the commands are often very subtle, making it difficult to detect any anomalies. One method for attempting to detect C2s is breaking down and analyzing the malware code. Organizations can try to disassemble the compiled code, from which they can sometimes identify the root source of the botnet’s commands. However, since botnet creators and administrators increasingly are using integrated encryption, this technique is less and less effective. Generally, C2 detection requires visibility into the communication between a C2 server and its bots, but only security solutions that specifically protect C2 servers will have this kind of visibility. A more common approach for detecting botnets is tracking and analyzing the attacks themselves — into which standard security solutions provide visibility — and determining which attacks originated from botnets. When looking at exploit attempts, there are a few possible indications for a botnet. For example, if the same IP addresses attack the same sites, at the same time, using the same payloads and attack patterns, there’s a good chance they’re part of a botnet. This is especially true if many IPs and sites are involved. One prominent example is a DDoS attempt by a botnet on a web service. The likelihood of false positives makes botnet detection particularly difficult. Some payloads are widely used, raising the probability of a randomly occurring pattern triggering a false positive. Additionally, attackers can change their IP addresses by using a virtual private network or a proxy, making it look like many attackers or bots are involved when there’s really only one. Hacking tools and vulnerability scanners also behave similarly enough to botnets to often return false positives. This is because hacking tools generate the same payloads and attack patterns, and many hackers use them, regardless of the color of their hat. And, if different players happen to conduct a penetration test on the same sites at the same time, it may look like a botnet attack. Organizations can often identify false positives by Googling the payload and referencing any documented information around it. Another technique involves simply gleaning any information readily available within the raw request in the security solution. For example, if a vulnerability scanner is to blame, most security solutions will reveal that by identifying it, especially if it’s one of the more common vulnerability scanners. False positives are an unavoidable challenge in botnet detection given the enormous amount of potential incidents; recent research shows that 27% of IT professionals receive over 1 million security alerts every day, while 55% receive more than 10,000. But with the right techniques and diligence, organizations can discern the harmless traffic from the malicious, botnet-driven traffic. The era of Internet of things (IoT) is upon us and it is impacting our lives. Today, technology has pervaded into nearly all walks of life, and constant innovation has made it almost impossible to stay disconnected. However, with all the convenience that connected devices offer, there is also a growing risk of cyber threats that can cripple the IoT networks and infrastructure, and cause considerable economic and personal harm to users. According to a report by Juniper Research, as much as 46 billion IoT devices are expected to be connected by 2021, while the cumulative cost of data breaches between 2017 and 2022 is expected to touch $8 trillion. Securing IoT would require adopting a future-ready, flexible and highly scalable cybersecurity strategy – a significant shift from current reactive approaches used by businesses that involve patching discovered vulnerabilities and adding new solutions without performing a comprehensive assessment. IoT makes it possible to connect previously closed devices and appliances to the Internet and allow users to control their operations remotely. However, as more closed systems are made accessible online, they also become increasingly vulnerable to cyberattacks and hacks. From smart homes and offices to connected cars, unmanned aerial vehicles, autonomous trucks and even to critical infrastructure like industrial control systems as part of industrial Internet of things (IIoT) – all existing and emerging IoT networks face a very high risk of cyber threats. An emerging technology alongside IoT which offers much promise in helping secure connected devices is blockchain technology. While blockchain technology gained prominence originally in the world of fintech by ushering in the revolution of digital payments, this underlying technology behind the success and rise of cryptocurrencies could play an important role in cybersecurity, especially in the IoT space. A blockchain-based cybersecurity platform can secure connected devices using digital signatures to identify and authenticate them, adding them as authorized participants in the blockchain network and ring-fencing critical infrastructure by rendering them invisible to unauthorized access attempts. Each authenticated device joining the blockchain-based secure IoT network is treated as a participating entity, just like in a conventional blockchain network. All communication among these verified participants (IoT devices) are cryptographically secure and are stored in tamper-proof logs. Every new device added to the network is registered by assigning a unique digital ID on the blockchain network, and the platform provides secure channels for inter-device communication and offers all connected devices secure access to core systems or infrastructure as well. A blockchain-based cybersecurity solution can additionally leverage Software-Defined Perimeter (SDP) architecture and utilize a Zero-Trust model to render all authenticated devices invisible to attackers. This means that only verified devices can “see” or know of the existence of other connected devices, adding an extra layer of security to the IoT infrastructure. A blockchain powered platform uses a decentralized set-up, further denying cyber attackers a single point of failure to target to bring down such a network. Consensus-based control distributes the responsibility of security across nodes within a blockchain network, making it impossible for hackers to spoof their way into such a network, and also protecting IoT networks from being brought down via DDoS attacks. Decentralization also makes such a solution highly scalable – one of the biggest concerns of implementing cybersecurity on an ever-growing network such as in the case of connected devices. With every new device that gets added/removed, the change is immediately notified to all participants, letting the system be adaptable and flexible to expand and evolve over time without significant upgrades to the platform in entirety. Such a system can be used to secure smart homes, connected autonomous vehicles, critical IIoT infrastructure and even entire smart cities. A cybersecurity solution based on blockchain technology enhanced using SDP architecture offers a next-generation, future-proof way to secure IoT devices, networks and communication, not just from present-day vulnerabilities and cyber risks, but remain just as robust in anticipating emerging vulnerabilities and offering protection against them. Both blockchain and IoT are emerging technologies, with most innovations in these domains being at nascent, proof-of-concept stages. However, blending the strengths of blockchain technology with the potential of IoT can quickly and effectively propel entire industries, cities and nations into the “smart” space, by easing the burden of securing an ever-expanding perimeter of unconventional devices and critical infrastructure without impeding the rate of innovation. FragmentSmack, a DDoS vulnerability first discovered in Linux, affects Windows as well as nearly 90 Cisco products. Discover how it can be exploited with Judith Myerson. A distributed denial-of-service vulnerability called FragmentSmack enables an unauthenticated remote attacker to disable servers with a stream of fragmented IP packets that activate the vulnerability on affected systems. First discovered in Linux, and now also found in Windows, FragmentSmack affects many products, including nearly 90 from Cisco. How can this vulnerability be exploited, and how big is the threat? FragmentSmack is a vulnerability in the IP stack that can be used to execute a distributed denial-of-service attack. The vulnerability affects Linux kernel version 3.9 or later, and it was discovered in some Cisco products by the Vulnerability Coordination team of the National Cyber Security Centre of Finland and the CERT Coordination Center. The flaw is caused by inefficient algorithms used in IP implementations to reassemble fragmented IPv4 and IPv6 packets. An attacker using the FragmentSmack vulnerability could exploit it remotely by continuously sending crafted packets — that appear to be fragments of larger packets that need to be reassembled — to cause the system to become unresponsive, as 100% of the CPU cores will be in use. In one scenario, an attacker could send a stream of 8-byte sized IP fragments, each starting with randomly chosen offset values, to a server. The queue of malformed IP fragments waiting for reassembly — which will never happen because the fragments are not part of any legitimate packets — increases in size until all the CPU core resources are consumed, leaving no room for other tasks the system needs to perform. The attacker doesn’t specify what core the malformed packets are sent to and the Linux kernel automatically distributes the reassembly to different cores. While such an attack could take a server down, once the flow of malicious fragments stops, the targeted server can resume its normal function. Cisco’s vulnerable listed products include network and content security devices, voice and unified communications devices, and telepresence and transcending devices. Likewise, this threat has extended to Microsoft and Red Hat, and the affected Microsoft’s Window systems include versions 7, 8.1 and 10, as well as all the Windows Server versions. Windows 10 — 64 bit — in particular, features an option for Windows Subsystem for Linux that is vulnerable. Turning off this option doesn’t prevent the attacker from exploiting the vulnerability, however. Vulnerable Red Hat products include Virtualization 4, Enterprise MRG, Enterprise Linux Atomic Host and Enterprise Linux versions 6, 7, Real Time 7, 7 for ARM64 and 7 for Power.